CHICAGO — A brand of crayons being sold at Dollar Tree and multiple online stores tested positive for asbestos, according to the U.S. Public Interest Research Group. 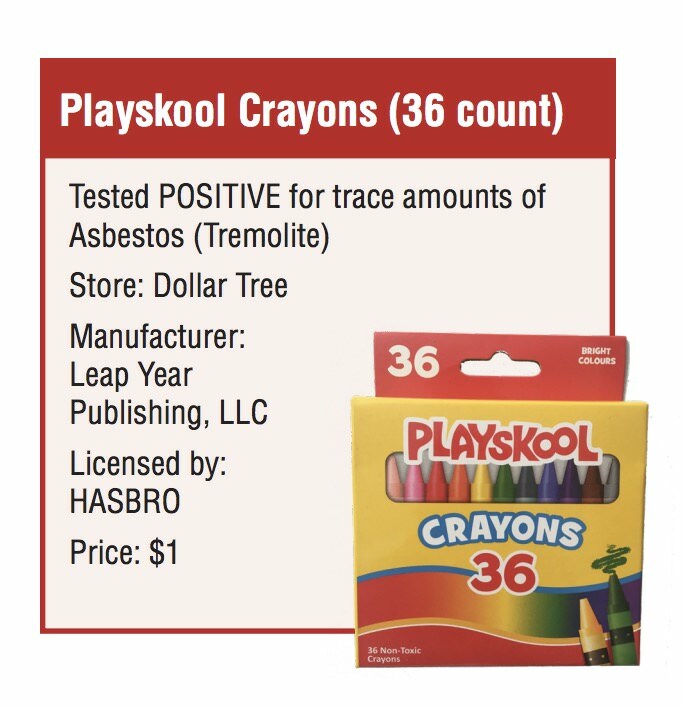 “We tested six types of crayons for asbestos and one tested positive for tremolite: Playskool crayons (36 count) that we purchased at Dollar Tree,” according to the report. The research group is calling on Dollar Tree and Playskool to recall the crayons and remove the product from store shelves. It also recommended the company contact customers to warn them about the product. “The safety of our customers and associates is our top priority,” Dollar Tree said in a statement. “Our company utilizes a very stringent and independent testing program to ensure our supplier products meet or exceed all safety and legal standards. U.S. PIRG also publishes an annual report about toy safety. Last year, the group identified two fidget spinners being sold at Target that contained more than 300 times the legal limit for lead in children’s products.